Funny ladies in the house! 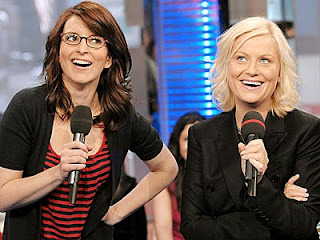 Tina Fey and Amy Poehler have been chosen to co-host the Golden Globes this year. I guess Ricky Gervais was telling the truth this time when he said that he wasn't going to be hosting the show again. I love Tina Fey, I think the woman is comedy gold, but Poehler...the jury is still out. She lays on the 'dumb' humour a little too much. But they have a good balance, so we'll see how this thing pans out.